Stephen is a Relationship Astrologer, Polarity Therapist, soon to be California state-certified Massage Therapist, and Musician. He specializes in using energy work and astrology to bridge the gap between all the different levels of the human being. The way he does this is by looking at the human being and any potential blockages or ailments from many different viewpoints, i.e. energetically, astrologically, mentally, physically, and spiritually. It is his passion to work with people in a way that helps free us of these blockages and increase expansion of our awareness. Join Onefeather and his guest Barrett Hadeen for an hour of thought provoking dialog about reincarnation and the recall of past lives. Barrett is able to tune in to the most significant prior life of the individual looking to uncover the reason for issues around health, relationships and other concerns in their current life and often offers an insight that will immediately help heal the issue at hand. Join Chris for an ongoing kaleidoscope of topics and guests centering on the quest for a non-dualistic experience of living in a dualistic reality. Sharing the mystical experience, Chris will offer ideas to the listener that are founded on ancient wisdom as well as progressive thought the accommodates life in the multidimensional world we inhabit! Join Chris this week with his special guest Dave Fishman. What does this all mean, tune in to find out as Carrie opens up her channel to share lots of great info on how to navigate through the Summer of 2017 while making a few HUGE announcements that may help YOU along YOUR divine journey at the same time! Carrie will also be announcing the winner of the “Complimentary Power of Clarity Reading” live from those who entered the VR contest – Value $80. So make sure you enter – you have till 2pm on June 12. to do so… good luck! Helping Kids with Autism and More! Paul will be discussing his personal story and how he was guided to create “The Star Room” and more! If you and/or anyone you know, has a loved one living with Autism, then this is a show you do not want to miss! Join Carrie this week as she taps into her channel and provides the listeners with a “Sneak Peek” into the NEW energies of Summer 2017 and how to navigate through them. When Carrie channels The Vibe Report, each video is anywhere from 45-90 mins long and they come out at least once a week. So please make sure you have your handy dandy notebook ready for she will be focusing on key dates regarding the “Extreme Energy Clusters” & “Drop Zones” to allow you to plan accordingly. Please note, that Carrie is not an astrologer however those with astrology knowledge will see how her channel aligns the messages with the cosmos. This paints a bigger picture for those who are listening in. We’re all a beautiful piece of the puzzle and when you intertwine the messages that resonate with your soul together, you begin to see life in a brand NEW way! 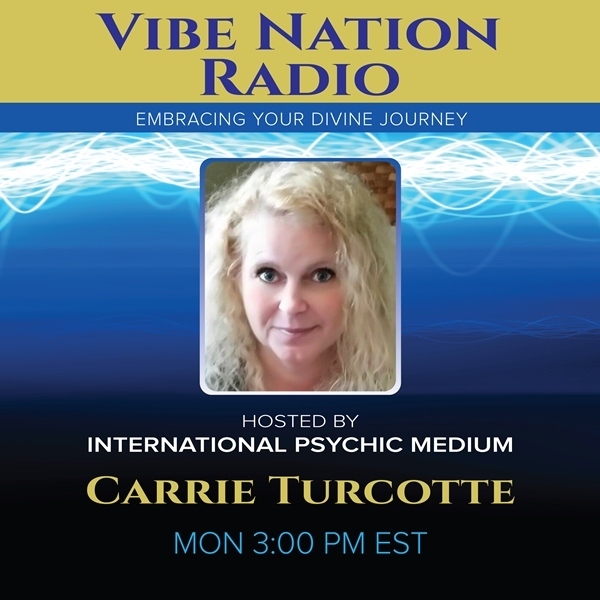 We’re all connected and in this together, so come join Carrie as she intertwines The Vibe Report with Vibe Nation Radio, and Spirit provides you with wisdom & knowledge about this upcoming Summer. For those who are not familiar with Carrie’s channel; you’re in for a treat! They always want you to leave the VR with a smile on your face and a song playing in your heart; and, of course make sure you have a lot of good laughs along the way – life is suppose to be fun and this channel is all about having fun while navigating through the crazy energies of New Earth! This is going to be a show you will not want to miss! Join Carrie this week as she discusses the difference between 3D/4D & 5D and how each dimension represents a different type of energy here on New Earth. Carrie will explain the difference between the dimensions and how by intertwining and aligning with these energies you can live a more love filled life! Join Carrie this week as she welcomes back her Special Guest Paul Avgerinos, GRAMMY® Winning Artist, Composer, Producer and Engineer (www.roundskymusic.com), as they speak about “The Power of Visual Meditations”. When one has difficulty quieting the mind, “Visual Meditations” can become an important modality one can use to help with the process of slowing the mind down and allowing the creative life source energy to begin to flow within. With the current energies continuing to shift into higher frequencies daily, Carrie & Paul will be speaking about the importance of having a daily meditation routine to help keep you aligned with your heart centre and stay grounded during these very transformational times. Paul will also be sharing how he was guided to create “Visual Meditations” for 2 songs on his most current album, AMMA – Devotional Songs to the Divine Mother, with more coming in the future. Join Carrie and her special guest, astrologer and intuitive Chris Anderson Onefeather, for insights and guidance for the month of May. What does the heavenly dance of the planets portend for the future? Powerful influences are affecting life on planet earth, so get the inside info. Join Carrie this week as she explains what is currently energetically happening here on Gaia and how it’s affecting every living organism (people, animals, nature). We’re all connected and created by energy so keeping your personal vibrations in check is the key to remain balanced. Carrie will guide her listeners to understand a simple and easy way to accomplish this, while living in the moment and having fun.